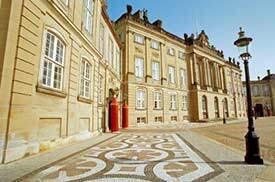 ABOVE: The Royal Family's official residence is Amalienborg Palace, just north of Nyhavn in the city center. These captioned photos (some with Web links) are from a Holland America Line cruise review on our cruising site, Europeforcruisers.com. See what the weather's like in the Danish capital.